One of the mysteries to me about Hamilton is how they decided to name their models. Pocket watches and wrist watches usually received names. Men's models got mens names and ladies watches got ladies names - although there are exceptions to the rule like automatics and watches named for other reasons... like places. Despite the fact that some obvious names were never used... like Joseph or David, there are a number of repeat uses of the same name. 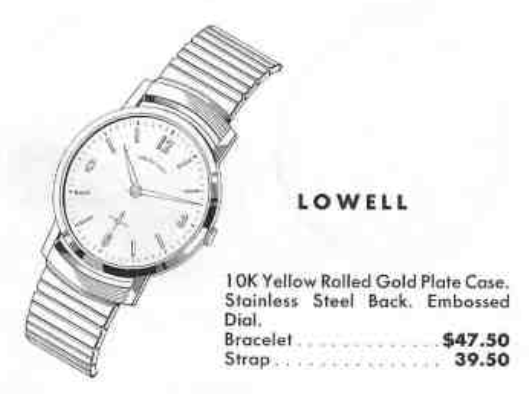 Take for example, the 1958 Lowell. There was an earlier Lowell from 1935. I guess 20+ years was enough time to eliminate any confusion between to models and the latter Lowell has nothing in common with the earlier version. The 1958 Lowell was produced for four years. The watch comes in a 10K RGP case with a stainless steel back. The white embossed dial with golden markers covers a Swiss-made Hamilton 673 movement - AKA an A. Schild AS 1200. I recently picked up a Lowell in need of some love. It wasn't running and it wasn't setting properly but my main concern was the brownish tone around the outside of the dial perimeter - that's a good indication that moisture got inside and compromised the dial finish. The case is very nice though - so this watch is definitely worth saving. The stainless steel back is engraved with three initials and the date 6-10-59. Without the beat up crystal in the way, you can see the finish on the dial is crackled. I could try my poor man's refinish if I can lighten the toning a little - otherwise I'll need to send this dial out to be refinished. The 673 movement is in decent shape. It's not obvious at this point what is preventing the watch from running. A gentle assessment of the balance indicates the balance staff is in good shape. I'm confident a thorough cleaning will do the trick. As soon as the dial was removed I discovered the reason for the setting issue, the set bridge, AKA set yoke, is broken. This little spring loaded arm covers the setting wheels and also acts like a detent to hold the set lever in either the winding position or the time-setting position. Reassembling the now-clean movement brings it back to life. It's running with good energy and a decent beat error too. Well, it took about 2 seconds for the brown tone on the dial to disappear but it took most of the minute track with it. My poor mans refinish won't work without the printing on the dial. So I'll send this dial out to be redone. It's a not a terribly complicated pattern - so it should come back okay, I bet. Come back in a few weeks to see how it turns out. In the mean time, checkout how this 1938 Gilman from last month turned out. Well, my refinished dial finally came back from the refinishers and they did a nice job matching the lettering and minute track. I'd much rather have a nice, complete original finish but a good refinish is an improvement over what I was left with above.